Great 2 Bedroom Unit on Kauai's Coconut Coast! Centrally located, with pool and beach. Aloha to the charming Kapaa Sands, located on Kauai's sunny Coconut Coast! This property features one Queen bed in the first bedroom, two Twin beds in the second bedroom, and an additional Queen Murphy Bed in the living area. Walk right outside from your living room lanai, right to the ocean's edge only yards away! 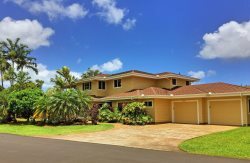 With a full, outfitted kitchen, nice pool area with BBQ's to use, and a great central location on the island, let the Kapaa Sands be your center for island fun! This location is perfect! Kapaa Sands is located on the beach with direct access to a spot that includes a protected area for small children to play safe. The first thing we saw when we entered the unit was the view of the ocean through the sliding glass doors. Heaven! Unit 22 is located on a small street, which keeps traffic noise down, and the master bedroom is on the ocean side so you fall asleep to the lovely sound of lapping waves.. It is next to the pool, which is clean, heated, and rarely used by guests. The interior is homey and clean with a well stocked kitchen. It was certainly spacious enough for 2 adults and 2 children. We loved the l'occitaine products, fluffy towels, charming decorations, as well as the more practical beach things we didn't think/want to travel with (including a well stocked bin of beach and surf toys!). Kapaa is a great location on the island, situated perfectly between Hanalei and Lihue. Kapaa has a lot to offer, too! Coconut Marketplace is within walking distance, and has a great bakery. We will definitely return, and stay at unit 22 again! And we cannot thank the owners and the rental manager, Ryan, for their heroic efforts to rebook our stay on incredibly short notice after our flight to Kauai was delayed 3 days due to a blizzard in Denver. Mahalo for your flexibility and generosity! Ryan, you were an absolute delight to work with and you literally saved our vacation! We stayed 4 nights in Unit 22 and it was great. Unit 22 was right next to the pool which was awesome for the kids. We loved that they had body boards, beach chairs, a beach umbrella and beach toys for the guests to use. The buildings are staggered so that even if you are in one of the back units you still get a view of the ocean. We would definitely come back to this place. The private beach was nice for little kids. It has a large tide pool that the kids can safely swim in without waves knocking them over. We were able to walk to restaurants and shops. Great central location if you want to see the whole island. This unit is great--true to what is presented on Airbnb. My family and I would be very happy to stay there again. We absolutely loved this place! Where to begin. Small, quiet, beautiful condo complex. It was outfitted with everything we could want in the kitchen as well as beach toys, coolers, snorkel equipment, etc. Right on the water and you could walk miles on the beach from our location. Town of Kapaa is adorable, funky and perfect for our tests. All amenities in a two minute drive. I will DEFINITELY stare here again. A real gem, and reasonable, too. Thank you!! Great location. Its centrally located and near stores and restaurants. They provide snorkeling gear and beach towels and chairs which is great. Great place!" This place is absolutely amazing. Wonderful locale - close to many shops, restaurants, farmer's market. The ocean is RIGHT there - we went in the water every day. We particularly appreciated the chest filled with amenities for a day at the beach. The space was very clean and we found everything we needed for cooking fresh fish and local veggies. We look forward to returning. We had a great time here. The Sands is centrally located in Kapaa, which made getting around easy and any issues we had were promptly taken care of by our host. The view from the beach is AMAZING! Terrific condo. Great location- peaceful and central to the island. Excellent amenities included extra towels and beach supplies. Recommend for families and couples which is a rare combo! We had a wonderful stay! This was our second trip to the island and this location was perfect. We met some fantastic people who have been coming to stay in the neighboring units for the last 20 years. They welcomed us and made us really feel like we were staying in a neighborhood. We were in walking distance to lots of great restaurants and enjoyed all the nearby activities. The condo was well maintained and private. We'd stay again and would encourage anyone to do the same.